Not to be confused with quinoline. Essential structure of all quinolone antibiotics: the blue drawn remainder of R is usually piperazine; if the connection contains fluorine (red), it is a fluoroquinolone. The quinolones are a family of synthetic broad-spectrum antibiotic drugs. Quinolones, and derivatives, have also been isolated from natural sources (such as plants, animals and bacteria) and can act as natural antimicrobials and/or signalling molecules. Quinolones exert their antibacterial effect by preventing bacterial DNA from unwinding and duplicating. The majority of quinolones in clinical use are fluoroquinolones, which have a fluorine atom attached to the central ring system, typically at the 6-position or C-7 position. Most of them are named with the -oxacin suffix. Fluoroquinolones are broad-spectrum antibiotics (effective for both gram-negative and gram-positive bacteria) that play an important role in treatment of serious bacterial infections, especially hospital-acquired infections and others in which resistance to older antibacterial classes is suspected. Because the use of broad-spectrum antibiotics encourages the spread of multidrug-resistant strains and the development of Clostridium difficile infections, treatment guidelines from the Infectious Diseases Society of America, the American Thoracic Society, and other professional organizations recommend minimizing the use of fluoroquinolones and other broad-spectrum antibiotics in less severe infections and in those in which risk factors for multidrug resistance are not present. As of 2016, the FDA recommended that "serious side effects associated with fluoroquinolone antibacterial drugs generally outweigh the benefits for patients with acute sinusitis, acute bronchitis, and uncomplicated urinary tract infections who have other treatment options. For patients with these conditions, fluoroquinolones should be reserved for those who do not have alternative treatment options." Fluoroquinolones are featured prominently in The American Thoracic Society guidelines for the treatment of hospital-acquired pneumonia. The Society recommends fluoroquinolones not be used as a first-line agent for community-acquired pneumonia, instead recommending macrolide or doxycycline as first-line agents. The Drug-Resistant Streptococcus pneumoniae Working Group recommends fluoroquinolones be used for the ambulatory treatment of community-acquired pneumonia only after other antibiotic classes have been tried and failed, or in cases with demonstrated drug-resistant Streptococcus pneumoniae. Fluoroquinolones are often used for genitourinary infections, and are widely used in the treatment of hospital-acquired infections associated with urinary catheters. In community-acquired infections, they are recommended only when risk factors for multidrug resistance are present or after other antibiotic regimens have failed. However, for serious acute cases of pyelonephritis or bacterial prostatitis where the patient may need to be hospitalised, fluoroquinolones are recommended as first-line therapy. Due to sickle-cell disease patients' being at increased risk for developing osteomyelitis from the Salmonella genus, fluoroquinolones are the "drugs of choice" due to their ability to enter bone tissue without chelating it, as tetracyclines are known to do. The use of fluoroquinolones to treat infections in children is controversial. In most countries, fluoroquinolones are approved for use in children only under narrowly-defined circumstances, owing in part to the observation of high rates of musculoskeletal adverse events in fluoroquinolone treated juvenile animals. In the UK, the prescribing indications for fluoroquinolones for children are severely restricted. Only inhalant anthrax and pseudomonal infections in cystic fibrosis infections are licensed indications in the UK due to ongoing safety concerns. In a study comparing the safety and efficacy of levofloxacin to that of azithromycin or ceftriaxone in 712 children with community-acquired pneumonia, serious adverse events were experienced by 6% of those treated with levofloxacin and 4% of those treated with comparator antibiotics. Most of these were considered by the treating physician to be unrelated or doubtfully related to the study drug. Two deaths were observed in the levofloxacin group, neither of which was thought to be treatment-related. Spontaneous reports to the FDA Adverse Effects Reporting System at the time of the 20 September 2011 FDA Pediatric Drugs Advisory Committee included musculoskeletal events (39, including 5 cases of tendon rupture) and central nervous system events (19, including 5 cases of seizures) as the most common spontaneous reports between April 2005 and March 2008. An estimated 130,000 pediatric prescriptions for levofloxacin were filled on behalf of 112,000 pediatric patients during that period. A number of recent meta-analyses have concluded that fluoroquinolones pose little or no additional risk to children compared to other antibiotic classes. Current recommendations by the American Academy of Pediatrics state that the use of fluoroquinolines in children may be appropriate when the infection is caused by multidrug-resistant bacteria, or when alternative treatment options require parenteral administration and oral therapy is preferred. While typical drug side effects reactions are mild to moderate; sometimes serious adverse effects occur. Prominent among these are side effects that became the subject of a black box warning by the FDA in 2016. The FDA wrote: "An FDA safety review has shown that fluoroquinolones when used systemically (i.e. tablets, capsules, and injectable) are associated with disabling and potentially permanent serious side effects that can occur together. These side effects can involve the tendons, muscles, joints, nerves, and central nervous system." Quinolones are associated with a small risk of tendinitis and tendon rupture; a 2013 review found the incidence of tendon injury among those taking fluoroquinolones to be between 0.08 and 0.2%. The risk appears to be higher among people older than 60 and those also taking corticosteroids; there may also be higher risk among people who are male, have a pre-existing joint or tendon issue, have kidney disease, and are highly active. Some experts have advised avoidance of fluoroquinolones in athletes. If tendonitis occurs, it generally appears within one month, and the most common tendon that is injured appears to be the Achilles tendon. The cause is not well understood. Nervous system effects include insomnia, restlessness, and rarely, seizure, convulsions, and psychosis Other rare and serious adverse events have been observed with varying degrees of evidence for causation. More generally, fluoroquinolones are tolerated, with typical drug side effects being mild to moderate. Common side effects include gastrointestinal effects such as nausea, vomiting, and diarrhea, as well as headache and insomnia. Postmarketing surveillance has revealed a variety of relatively rare but serious adverse effects that are associated with all members of the fluoroquinolone antibacterial class. Among these, tendon problems and exacerbation of the symptoms of the neurological disorder myasthenia gravis are the subject of "black box" warnings in the United States. The overall rate of adverse events in patients treated with fluoroquinolones is roughly similar to that seen in patients treated with other antibiotic classes. A U.S. Centers for Disease Control and Prevention study found patients treated with fluoroquinolones experienced adverse events severe enough to lead to an emergency department visit more frequently than those treated with cephalosporins or macrolides, but less frequently than those treated with penicillins, clindamycin, sulfonamides, or vancomycin. Fluoroquinolones prolong the heart's QT interval by blocking voltage-gated potassium channels. Prolongation of the QT interval can lead to torsades de pointes, a life-threatening arrhythmia, but in practice this appears relatively uncommon in part because the most widely prescribed fluoroquinolones (ciprofloxacin and levofloxacin) only minimally prolong the QT interval. Clostridium difficile colitis may occur in connection with the use of any antibacterial drug, especially those with a broad spectrum of activity such as clindamycin, cephalosporins, and fluoroquinolones. Fluoroquinoline treatment is associated with risk that is similar to or less than that associated with broad spectrum cephalosporins. Fluoroquinoline administration may be associated with the acquisition and outgrowth of a particularly virulent Clostridium strain. Events that may occur in acute overdose are rare, and include renal failure and seizure. Susceptible groups of patients, such as children and the elderly, are at greater risk of adverse reactions during therapeutic use. Quinolones are contraindicated if a patient has epilepsy, QT prolongation, pre-existing CNS lesions, or CNS inflammation, or the patient has suffered a stroke. They are best avoided in the athlete population. Safety concerns exist for fluoroquinolone use during pregnancy, so they are contraindicated unless no other safe alternative antibiotic exists. However, one meta-analysis looking at the outcome of pregnancies involving quinolone use in the first trimester found no increased risk of malformations. They are also contraindicated in children due to the risks of damage to the musculoskeletal system. Their use in children is not absolutely contraindicated, however. For certain severe infections where other antibiotics are not an option, their use can be justified. Quinolones should also not be given to people with a known hypersensitivity to the drug. The basic pharmacophore, or active structure, of the fluoroquinolone class is based upon the quinoline ring system. The addition of the fluorine atom at C6 distinguishes the successive-generation fluoroquinolones from the first-generation of quinolones. The addition of the C6 fluorine atom has since been demonstrated not to be required for the antibacterial activity of this class (circa 1997). First and second generation fluoroquinolones selectively inhibit the topoisomerase II ligase domain, leaving the two nuclease domains intact. This modification, coupled with the constant action of the topoisomerase II in the bacterial cell, leads to DNA fragmentation via the nucleasic activity of the intact enzyme domains. Third and fourth generation fluoroquinolones are more selective for the topoisomerase IV ligase domain, and thus have enhanced gram-positive coverage. Fluoroquinolones can enter cells easily via porins and, therefore, are often used to treat intracellular pathogens such as Legionella pneumophila and Mycoplasma pneumoniae. For many gram-negative bacteria, DNA gyrase is the target, whereas topoisomerase IV is the target for many gram-positive bacteria. Some compounds in this class have been shown to inhibit the synthesis of mitochondrial DNA. The mechanisms of the toxicity of fluoroquinolones have been attributed to their interactions with different receptor complexes, such as blockade of the GABAa receptor complex within the central nervous system, leading to excitotoxic type effects and oxidative stress. a: Dosage applies only to Cmax and AUC. The other parameters an average of the values available in the literature irrespective of dosage. Products containing multivalent cations, such as aluminium- or magnesium-containing antacids, and products containing calcium, iron or zinc invariably result in marked reduction of oral absorption of fluoroquinolones. Other drugs that interact with fluoroquinolones include sucralfate, probenecid, cimetidine, theophylline, warfarin, antiviral agents, phenytoin, cyclosporine, rifampin, pyrazinamide, and cycloserine. Administration of quinolone antibiotics to a benzodiazepine dependent individual can precipitate acute benzodiazepine withdrawal symptoms due to quinolones displacing benzodiazepines from their binding site. Fluoroquinolones have varying specificity for cytochrome P450, and so may have interactions with drugs cleared by those enzymes; the order from most P450-inhibitory to least, is enoxacin > ciprofloxacin > norfloxacin > ofloxacin, levofloxacin, trovafloxacin, gatifloxacin, moxifloxacin. Resistance to quinolones can evolve rapidly, even during a course of treatment. Numerous pathogens, including Escherichia coli, commonly exhibit resistance. Widespread veterinary usage of quinolones, in particular in Europe, has been implicated. Fluoroquinolones had become the class of antibiotics most commonly prescribed to adults in 2002. Nearly half (42%) of these prescriptions were for conditions not approved by the FDA, such as acute bronchitis, otitis media, and acute upper respiratory tract infection, according to a study supported in part by the Agency for Healthcare Research and Quality. In addition, they are commonly prescribed for medical conditions, such as acute respiratory illness, that are usually caused by viral infections. Three mechanisms of resistance are known. Some types of efflux pumps can act to decrease intracellular quinolone concentration. 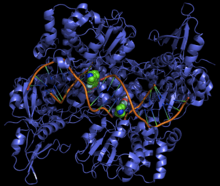 In gram-negative bacteria, plasmid-mediated resistance genes produce proteins that can bind to DNA gyrase, protecting it from the action of quinolones. Finally, mutations at key sites in DNA gyrase or topoisomerase IV can decrease their binding affinity to quinolones, decreasing the drugs' effectiveness. The first quinolone was nalidixic acid - introduced in 1962 for treatment of urinary tract infections in humans. Nalidixic acid was discovered by George Lesher and coworkers in a distillate during an attempt at chloroquine synthesis. Nalidixic acid is thus considered to be the predecessor of all members of the quinolone family, including the second, third and fourth generations commonly known as fluoroquinolones. This first generation also included other quinolone drugs, such as pipemidic acid, oxolinic acid, and cinoxacin, which were introduced in the 1970s. They proved to be only marginal improvements over nalidixic acid. Since the introduction of nalidixic acid in 1962, more than 10,000 analogs have been synthesized, but only a handful have found their way into clinical practice. Partly as a result of the efforts of Public Citizen, in 2008 the FDA ordered boxed warnings on all fluoroquinolones, advising consumers of an enhanced risk of tendon damage. On November 5, 2015, the FDA held a joint meeting of the Antimicrobial Drugs Advisory Committee and the Drug Safety and Risk Management Advisory Committee to discuss risks and benefits of the systemic fluoroquinolone antibacterial drugs for the acute bacterial sinusitis, acute bacterial exacerbations of bronchitis in people with chronic obstructive pulmonary disease, and uncomplicated urinary tract infections. The FDA asked the committee to review reports of tendonitis and tendon ruputure, peripheral neuropathy, and cardiac arrhythmia associated with long-term disability to determine whether the benefits of fluoroquinolone therapy in these indications justifies the associated risk. The 21-member joint committee overwhelmingly recommended stronger label warnings on the containers because of rare but sometimes devastating side effects. Researchers divide the quinolones into generations based on their antibacterial spectrum. The earlier-generation agents are, in general, more narrow-spectrum than the later ones, but no standard is employed to determine which drug belongs to which generation. The only universal standard applied is the assignment of the nonfluorinated drugs found within this class (quinolones) to the 'first-generation' heading. As such, a wide variation exists within the literature dependent upon the methods employed by the authors. The first generation is rarely used today. Nalidixic acid was added to the OEHHA Prop 65 list as a carcinogen on 15 May 1998. A number of the second-, third-, and fourth-generation drugs have been removed from clinical practice due to severe toxicity issues or discontinued by their manufacturers. The drugs most frequently prescribed today consist of Avelox (moxifloxacin), Cipro (ciprofloxacin), Levaquin (levofloxacin), and, to some extent, their generic equivalents. The second-generation class is sometimes subdivided into "Class 1" and "Class 2". Unlike the first- and second-generations, the third-generation is active against streptococci. Fourth-generation fluoroquinolones act at DNA gyrase and topoisomerase IV. This dual action slows development of resistance. The quinolones have been widely used in agriculture, and several agents have veterinary, but not human, applications. However, the agricultural use of fluoroquinolones in the US has been restricted since 1997, due to concerns over the development of antibiotic resistance. The practice of using fluoroquinolones is still prevalent in the UK. ↑ Andriole, VT The Quinolones. Academic Press, 1989. ↑ Andersson MI, MacGowan AP (2003). "Development of the quinolones". Journal of Antimicrobial Chemotherapy. 51 (Suppl. S1): 1–11. doi:10.1093/jac/dkg212. ↑ Ivanov DV, Budanov SV (2006). "[Ciprofloxacin and antibacterial therapy of respiratory tract infections]". Antibiot. Khimioter. (in Russian). 51 (5): 29–37. PMID 17310788. ↑ Heeb, S.; Fletcher, M. P.; Chhabra, S. R.; Diggle, S. P.; Williams, P.; Cámara, M. (2011). "Quinolones: from antibiotics to autoinducers" (PDF). FEMS Microbiology Reviews. 35 (2): 247–274. doi:10.1111/j.1574-6976.2010.00247.x. PMC 3053476 . PMID 20738404. ↑ Hooper, DC. (Mar–Apr 2001). "Emerging mechanisms of fluoroquinolone resistance". Emerging Infectious Diseases. 7 (2): 337–41. doi:10.3201/eid0702.010239. PMC 2631735 . PMID 11294736. ↑ "Guidelines for the management of adults with hospital-acquired, ventilator-associated, and healthcare-associated pneumonia". American Journal of Respiratory and Critical Care Medicine. 171 (4): 388–416. February 2005. doi:10.1164/rccm.200405-644ST. PMID 15699079. ↑ Mandell LA, Wunderink RG, Anzueto A, et al. (March 2007). "Infectious Diseases Society of America/American Thoracic Society consensus guidelines on the management of community-acquired pneumonia in adults". Clinical Infectious Diseases. 44 Suppl 2: S27–72. doi:10.1086/511159. PMID 17278083. ↑ MacDougall C, Guglielmo BJ, Maselli J, Gonzales R (March 2005). "Antimicrobial drug prescribing for pneumonia in ambulatory care". Emerging Infectious Disease. 11 (3): 380–4. doi:10.3201/eid1103.040819. PMC 3298265 . PMID 15757551. ↑ Liu, H.; Mulholland, SG. (July 2005). "Appropriate antibiotic treatment of genitourinary infections in hospitalized patients". American Journal of Medicine. 118 Suppl 7A (7): 14S–20S. doi:10.1016/j.amjmed.2005.05.009. PMID 15993673. ↑ "Adverse Event Review: Levaquin® (levofloxacin): Pediatric Advisory Committee Meeting" (PDF). Food and Drug Administration. 18 November 2008. ↑ Sung L, Manji A, Beyene J, et al. (May 2012). "Fluoroquinolones in children with fever and neutropenia: a systematic review of prospective trials". The Pediatric Infectious Disease Journal. 31 (5): 431–5. doi:10.1097/INF.0b013e318245ab48. PMID 22189521. ↑ Rosanova MT, Lede R, Capurro H, Petrungaro V, Copertari P (December 2010). "[Assessing fluoroquinolones as risk factor for musculoskeletal disorders in children: a systematic review and meta-analysis]". Archivos Argentinos de Pediatria (in Spanish). 108 (6): 524–31. doi:10.1590/S0325-00752010000600008. PMID 21132249. ↑ Forsythe CT, Ernst ME (November 2007). "Do fluoroquinolones commonly cause arthropathy in children?". Canadian journal of emergency medicine. 9 (6): 459–62. PMID 18072993. ↑ John S. Bradley; Mary Anne Jackson (October 2011). "The Use of Systemic and Topical Fluoroquinolones" (PDF). Pediatrics. 128 (4). doi:10.1542/peds.2011-149. 1 2 3 4 Stephenson, AL; Wu, W; Cortes, D; Rochon, PA (September 2013). "Tendon Injury and Fluoroquinolone Use: A Systematic Review.". Drug safety. 36 (9): 709–21. PMID 23888427. 1 2 Lewis, T; Cook, J (2014). "Fluoroquinolones and tendinopathy: a guide for athletes and sports clinicians and a systematic review of the literature.". Journal of athletic training. 49 (3): 422–7. PMC 4080593 . PMID 24762232. ↑ Galatti L, Giustini SE, Sessa A, et al. (March 2005). "Neuropsychiatric reactions to drugs: an analysis of spontaneous reports from general practitioners in Italy". Pharmacological Research. 51 (3): 211–6. doi:10.1016/j.phrs.2004.08.003. PMID 15661570. ↑ Babar, S. (October 2013). "SIADH Associated With Ciprofloxacin." (PDF). The Annals of Pharmacotherapy. Sage Publishing. 47 (10): 1359–1363. doi:10.1177/1060028013502457. ISSN 1060-0280. PMID 24259701. Retrieved November 13, 2013. ↑ Rouveix, B. (Nov–Dec 2006). "[Clinically significant toxicity and tolerance of the main antibiotics used in lower respiratory tract infections]". Médecine et Maladies Infectieuses. 36 (11–12): 697–705. doi:10.1016/j.medmal.2006.05.012. PMID 16876974. ↑ Mehlhorn AJ, Brown DA (November 2007). "Safety concerns with fluoroquinolones". The Annals of Pharmacotherapy. 41 (11): 1859–66. doi:10.1345/aph.1K347. PMID 17911203. ↑ Jones SF, Smith RH (March 1997). "Quinolones may induce hepatitis". The BMJ. 314 (7084): 869. doi:10.1136/bmj.314.7084.869. PMC 2126221 . PMID 9093098. 1 2 Owens RC, Ambrose PG (July 2005). "Antimicrobial safety: focus on fluoroquinolones". Clinical Infectious Diseases. 41 Suppl 2: S144–57. doi:10.1086/428055. PMID 15942881. 1 2 3 De Sarro A, De Sarro G (March 2001). "Adverse reactions to fluoroquinolones. an overview on mechanistic aspects". Current Medicinal Chemistry. 8 (4): 371–84. doi:10.2174/0929867013373435. PMID 11172695. 1 2 Jonathan G. Levine; Ana Szarfman (15 December 2006). "Data Mining Analysis of Multiple Antibiotics in AERS" (Microsoft PowerPoint). Food and Drug Administration. ↑ Skalsky K, Yahav D, Lador A, Eliakim-Raz N, Leibovici L, Paul M (April 2013). "Macrolides vs. quinolones for community-acquired pneumonia: meta-analysis of randomized controlled trials". Clinical Microbiology and Infection. 19 (4): 370–8. doi:10.1111/j.1469-0691.2012.03838.x. PMID 22489673. ↑ Falagas ME, Matthaiou DK, Vardakas KZ (December 2006). "Fluoroquinolones vs beta-lactams for empirical treatment of immunocompetent patients with skin and soft tissue infections: a meta-analysis of randomized controlled trials". Mayo Clinic Proceedings. 81 (12): 1553–66. doi:10.4065/81.12.1553. PMID 17165634. ↑ Van Bambeke F, Tulkens PM (2009). "Safety profile of the respiratory fluoroquinolone moxifloxacin: comparison with other fluoroquinolones and other antibacterial classes". Drug Safety. 32 (5): 359–78. doi:10.2165/00002018-200932050-00001. PMID 19419232. ↑ Shehab N, Patel PR, Srinivasan A, Budnitz DS (September 2008). "Emergency department visits for antibiotic-associated adverse events". Clinical Infectious Diseases. 47 (6): 735–43. doi:10.1086/591126. PMID 18694344. ↑ Heidelbaugh JJ, Holmstrom H (April 2013). "The perils of prescribing fluoroquinolones". The Journal of Family Practice. 62 (4): 191–7. PMID 23570031. ↑ Rubinstein E, Camm J (April 2002). "Cardiotoxicity of fluoroquinolones". Journal of Antimicrobial Chemotherapy. 49 (4): 593–6. doi:10.1093/jac/49.4.593. PMID 11909831. ↑ Deshpande A, Pasupuleti V, Thota P, et al. (September 2013). "Community-associated Clostridium difficile infection and antibiotics: a meta-analysis". Journal of Antimicrobial Chemotherapy. 68 (9): 1951–61. doi:10.1093/jac/dkt129. PMID 23620467. ↑ Slimings C, Riley TV (December 2013). "Antibiotics and hospital-acquired Clostridium difficile infection: update of systematic review and meta-analysis". Journal of Antimicrobial Chemotherapy. 69 (4): 881–891. doi:10.1093/jac/dkt477. PMID 24324224. ↑ Vardakas KZ, Konstantelias AA, Loizidis G, Rafailidis PI, Falagas ME (November 2012). "Risk factors for development of Clostridium difficile infection due to BI/NAP1/027 strain: a meta-analysis". International Journal of Infectious Diseases. 16 (11): e768–73. doi:10.1016/j.ijid.2012.07.010. PMID 22921930. ↑ Nelson, Lewis H.; Flomenbaum, Neal; Goldfrank, Lewis R.; Hoffman, Robert Louis; Howland, Mary Deems; Neal A. Lewin (2006). Goldfrank's toxicologic emergencies. New York: McGraw-Hill, Medical Pub. Division. ISBN 0-07-143763-0. ↑ Iannini PB (June 2007). "The safety profile of moxifloxacin and other fluoroquinolones in special patient populations". Current Medical Research and Opinion. 23 (6): 1403–13. doi:10.1185/030079907X188099. PMID 17559736. ↑ Farinas, Evelyn R; Public Health Service Food and Drug Administration Center for Drug Evaluation and Research (1 March 2005). "Consult: One-Year Post Pediatric Exclusivity Postmarketing Adverse Events Review" (PDF). Food and Drug Administration. Retrieved 31 August 2009. ↑ Nardiello, S.; Pizzella, T.; Ariviello, R. (March 2002). "[Risks of antibacterial agents in pregnancy]". Le Infezioni in Medicina. 10 (1): 8–15. PMID 12700435. ↑ Bar-Oz B, Moretti ME, Boskovic R, O'Brien L, Koren G (Apr 2009). "The safety of quinolones--a meta-analysis of pregnancy outcomes". European Journal of Obstetrics & Gynecology and Reproductive Biology. 143 (2): 75–8. doi:10.1016/j.ejogrb.2008.12.007. ↑ Noel, GJ. ; Bradley, JS. ; Kauffman, RE. ; Duffy, CM. ; Gerbino, PG. ; Arguedas, A.; Bagchi, P.; Balis, DA. ; Blumer, JL. (October 2007). "Comparative safety profile of levofloxacin in 2523 children with a focus on four specific musculoskeletal disorders". The Pediatric Infectious Disease Journal. 26 (10): 879–91. doi:10.1097/INF.0b013e3180cbd382. PMID 17901792. ↑ Leibovitz, E.; Dror, Yigal (February 2006). "The use of fluoroquinolones in children". Current Opinion in Pediatrics. 18 (1): 64–70. doi:10.1097/01.mop.0000192520.48411.fa. PMID 16470165. ↑ Janssen Pharmaceutica (September 2008). "Highlights of Prescribing Information" (PDF). Food and Drug Administration. ↑ Scherer, K.; Bircher, AJ. (January 2005). "Hypersensitivity reactions to fluoroquinolones". Current Allergy and Asthma Reports. 5 (1): 15–21. doi:10.1007/s11882-005-0049-1. PMID 15659258. ↑ Schaumann, R.; Rodloff, A. C. (January 2007). "Activities of Quinolones Against Obligately Anaerobic Bacteria" (PDF). Anti-Infective Agents in Medicinal Chemistry. Bentham Science Publishers. 6 (1): 49–56. doi:10.2174/187152107779314179. ↑ Chang Y. H.; Se H. K.; Young K. K. (22 July 1997). "Novel 5-amino-6-methylquinolone antibacterials: A new class of non-6-fluoroquinolones". Bioorganic & Medicinal Chemistry Letters. Elsevier. 7 (14): 1875–1878. doi:10.1016/S0960-894X(97)00324-7. ↑ Bergan T.; Bayer (1988). Pharmacokinetics of fluorinated quinolones. Academic Press. pp. 119–154. ↑ Bergan T; Dalhoff A; Thorsteinsson SB (1985). "A review of the pharmacokinetics and tissue penetration of ciprofloxacin": 23–36. ↑ Castora, F. J.; Vissering, F. F.; Simpson, M. V. (September 1983). "The effect of bacterial DNA gyrase inhibitors on DNA synthesis in mammalian mitochondria". Biochimica et Biophysica Acta. 740 (4): 417–27. doi:10.1016/0167-4781(83)90090-8. PMID 6309236. ↑ Suto, MJ. ; Domagala, JM. ; Roland, GE. ; Mailloux, GB. ; Cohen, MA. (December 1992). "Fluoroquinolones: relationships between structural variations, mammalian cell cytotoxicity, and antimicrobial activity". Journal of Medicinal Chemistry. 35 (25): 4745–50. doi:10.1021/jm00103a013. PMID 1469702. ↑ De Sarro, A (July 1999). "Effects of Novel 6-Desfluoroquinolones and Classic Quinolones on Pentylenetetrazole-Induced Seizures in Mice". Antimicrobial Agents and Chemotherapy. US National Library of Medicine. 43 (7): 1729–1736. PMC 89352 . PMID 10390231. ↑ Unseld, Elizabeth; G Ziegler; A Gemeinhardt; U Janssen; U Klotz (July 1990). "Possible interaction of fluoroquinolones with the benzodiazepine-GABAA-receptor complex" (pdf). British Journal of Clinical Pharmacology. 30 (1): 63–70. doi:10.1111/j.1365-2125.1990.tb03744.x. PMC 1368276 . PMID 2167717. Retrieved October 17, 2015. ↑ Saint F, Salomon L, Cicco A, de la Taille A, Chopin D, Abbou CC (December 2001). "[Tendinopathy associated with fluoroquinolones: individuals at risk, incriminated physiopathologic mechanisms, therapeutic management]". Progrès en Urologie (in French). 11 (6): 1331–4. PMID 11859676. ↑ Zhanel GG, Fontaine S, Adam H, Schurek K, Mayer M, Noreddin AM, Gin AS, Rubinstein E, Hoban DJ (2006). "A Review of New Fluoroquinolones : Focus on their Use in Respiratory Tract Infections". Treat Respir Med. 5 (6): 437–65. PMID 17154673. 1 2 3 Fish DN (2001). "Fluoroquinolone Adverse Effects and Drug Interactions". Pharmacotherapy. 21 (10 Suppl): 253S–272S. doi:10.1592/phco.21.16.253S.33993. ↑ Ford, Chris; Law, Fergus (July 2014). "Guidance for the use and reduction of misuse of benzodiazepines and other hypnotics and anxiolytics in general practice" (PDF). SMMGP. ↑ M Jacobs, Worldwide Overview of Antimicrobial Resistance. International Symposium on Antimicrobial Agents and Resistance 2005. ↑ Nelson, JM. ; Chiller, TM. ; Powers, JH. ; Angulo, FJ. (April 2007). "Fluoroquinolone-resistant Campylobacter species and the withdrawal of fluoroquinolones from use in poultry: a public health success story" (PDF). Clinical Infectious Diseases. 44 (7): 977–80. doi:10.1086/512369. PMID 17342653. ↑ Linder JA, Huang ES, Steinman MA, Gonzales R, Stafford RS (March 2005). "Fluoroquinolone prescribing in the United States: 1995 to 2002". The American Journal of Medicine. 118 (3): 259–68. doi:10.1016/j.amjmed.2004.09.015. PMID 15745724. ↑ Neuhauser, MM; Weinstein, RA; Rydman, R; Danziger, LH; Karam, G; Quinn, JP (2003). "Antibiotic resistance among gram-negative bacilli in US intensive care units: implications for fluoroquinolone use". JAMA: The Journal of the American Medical Association. 289 (7): 885–8. doi:10.1001/jama.289.7.885. PMID 12588273. From 1995 to 2002, inappropriate antibiotic prescribing for acute respiratory infections, which are usually caused by viruses and thus are not responsive to antibiotics, declined from 61 to 49 percent. However, the use of broad-spectrum antibiotics such as the fluoroquinolones, jumped from 41 to 77 percent from 1995 to 2001. Overuse of these antibiotics will eventually render them useless for treating antibiotic-resistant infections, for which broad-spectrum antibiotics are supposed to be reserved. ↑ Robicsek A, Jacoby GA, Hooper DC (October 2006). "The worldwide emergence of plasmid-mediated quinolone resistance". The Lancet Infect Diseases. 6 (10): 629–40. doi:10.1016/S1473-3099(06)70599-0. PMID 17008172. ↑ Morita Y, Kodama K, Shiota S, Mine T, Kataoka A, Mizushima T, Tsuchiya T (July 1998). "NorM, a Putative Multidrug Efflux Protein, of Vibrio parahaemolyticus and Its Homolog in Escherichia coli". Antimicrobial Agents and Chemotherapy. 42 (7): 1778–82. PMC 105682 . PMID 9661020. ↑ sanofi-aventis U.S. LLC (September 2008). "NegGram Caplets (nalidixic acid, USP)" (PDF). Food and Drug Administration. ↑ Wentland MP: In memoriam: George Y. Lesher, Ph.D., in Hooper DC, Wolfson JS (eds): Quinolone antimicrobial agents, ed 2., Washington DC, American Society for Microbiology : XIII - XIV, 1993. ↑ Norris, S; Mandell, GL (1988). "The quinolones: history and overview". The quinolones: history and overview. San Diego: Academic Press Inc. pp. 1–22. ↑ "FDA orders 'black box' label on some antibiotics". CNN. 8 July 2008. Retrieved 8 July 2008. ↑ Research, Center for Drug Evaluation and. "Antimicrobial Drugs Advisory Committee (formerly known as the Anti-Infective Drugs Advisory Committee) - Briefing Information for the November 5, 2015 Joint Meeting of the Antimicrobial Drugs Advisory Committee (AMDAC) and the Drug Safety and Risk Management Advisory Committee (DSaRM)". Food and Drug Administration. Retrieved 2015-10-19. ↑ Burton, Thomas M. (6 November 2015). "FDA Panel Seeks Tougher Antibiotic Labels". The Wall Street Journal. Retrieved 6 November 2015. ↑ Ball P (2000). "Quinolone generations: natural history or natural selection?". Journal of Antimicrobial Chemotherapy. 46 Suppl T1 (Supplement 3): 17–24. doi:10.1093/oxfordjournals.jac.a020889. PMID 10997595. ↑ Dana E. King; Robb Malone; Sandra H. Lilley (1 May 2000). "New Classification and Update on the Quinolone Antibiotics". American Family Physician. 61 (9): 2741–2748. Retrieved 18 March 2008. 1 2 3 4 5 6 7 8 Catherine M. Oliphant; Gary M. Green (1 February 2002). "Quinolones: A Comprehensive Review". American Family Physician. 65 (3): 455–465. 1 2 Oliphant CM, Green GM (February 2002). "Quinolones: a comprehensive review". American Family Physician. 65 (3): 455–64. PMID 11858629. 1 2 3 Paul G. Ambrose; Robert C. Owens, Jr (1 March 2000). "Clinical Usefulness Of Quinolones". Seminars in Respiratory and Critical Care Medicine. Medscape. ↑ The European Medicines Agency (24 July 2008). "EMEA Restricts Use of Oral Norfloxacin Drugs in UTIs". Doctor's Guide. ↑ Walter Sneader (31 October 2005). Drug Discovery: A History. John Wiley & Sons. p. 295. ISBN 978-0-470-01552-0. ↑ Paul G. Ambrose; Robert C. Owens, Jr (1 March 2000). "New Antibiotics in Pulmonary and Critical Care Medicine: Classification Of Quinolones By Generation". Seminars in Respiratory and Critical Care Medicine. 21 (1). ↑ Gupta (2009). Clinical Ophthalmology: Contemporary Perspectives, 9/e. Elsevier India. pp. 112–. ISBN 978-81-312-1680-4. Retrieved 20 September 2010. ↑ Schmid, Randolph E. (1 May 2006). "Drug Company Taking Tequin Off Market". Associated Press. Archived from the original on 25 Nov 2007. Retrieved 1 May 2006. ↑ "FDA Order Prohibits Extralabel Use Of Fluoroquinolones And Glycopeptides". Food and Drug Administration. 2 June 1997. Retrieved 16 April 2013. ↑ "Banned in America, soaring use in Britain: The poultry farm drugs that put human lives at risk". Bureau of Investigative Journalism. 7 February 2016. Retrieved 8 May 2016.